Students at Wakefield High School in Arlington, VA have been using Naviance throughout high school. Members of the class of 2015 served as Hobsons summer interns and look back on how Naviance helped them along the way. My school began incorporating Naviance into a technology class my freshman year. One of the Naviance tools that we utilized was the Career Interest Profiler, which matches students to careers based on a questionnaire that determines their strongest interests. I remember the results were accurate because as a rising senior, I’m thinking about majoring in fashion design, which was on the matching occupation list I got freshman year. After we found an occupation we might be interested in, we did college research on Naviance. We were able to find colleges that offered majors we were interested in, how many years of college it took to complete, and other statistics such as the employment rate and average salary of our dream occupations and colleges. This was very helpful because it gave me a reality check. I had an idea of some schools I was interested in but never really looked into them. Freshmen year, I was really only thinking of The Fashion Institute of Design & Merchandising (FIDM) because someone told me they specialized in fashion and I had not discovered other options. But going to FIDM was unrealistic. I was not going to be traveling from California to Virginia and vice versa for every school break, nor was I going to be happy being so far from my family for months. The technology class project helped me discover and research schools closer to me that offered fashion such as The Fashion Institute of Technology and Virginia Commonwealth University. It’s one thing to say that you want to major in something but it’s another to say I have to do this, this and this to achieve that major. Today, I am using Naviance’s SuperMatch college search, scattergrams, and PrepMe. As I find schools that fit me, I pin them so that I can compare them to each other. I then look at the costs of the schools since they all match my wants and needs already. This is really helpful because it narrows the list down and my chances of applying to the wrong school are minimized. I’ve also gone on college tours and know that a college that offers fashion located in an urban environment on the East Coast is a must for me. The scattergram is helpful with college considerations as well because I am able to see what GPA and SAT/ACT combinations (from my high school) got accepted to different universities. I can see where I would fall and infer whether I’ll be rejected or accepted into that school. Unfortunately, my SAT scores were not as high as I wanted them to be. I’m going to retake the test in October and use PrepMe to prepare. I took the SAT diagnostic test on PrepMe and now have a customized practice schedule. The weekly agenda really helps me not procrastinate because if it were up to me, I would just leave my SAT practice to the day before the test like I did in June. I love using PrepMe because it’s not like your usual, boring test prep. I hate reading, so the voiceover on the video really helps me engage in the course. PrepMe has taught me tips and strategies that will get me extra points on test day. Every student is different; therefore, they each require improvement in different areas. PrepMe is perfect for giving me what I need to improve my scores. "PrepMe helped me the most with English. I already had the math component down but not the writing nor critical reading components. It has helped me a lot with my weak areas. Even in English class, I would remember things that I learned on PrepMe and I would use that knowledge." "I was able to find several scholarships in Naviance that were personalized to my interests. My counselor sent me one related to women in the medical field and I found another from the Bill and Melinda Gates Foundation." I am so glad that my school offers Naviance. It is truly a benefit. 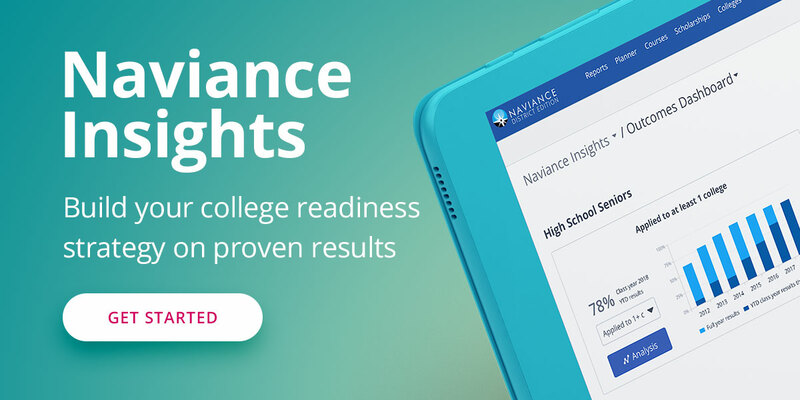 How is Naviance helping your students?